I’m thrilled to report on two awesome and inspiring experiences in NYC! 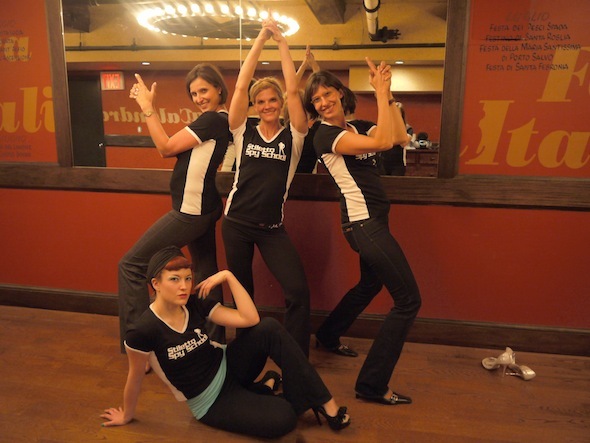 Last Saturday, I’ve attended a Mission at the Stiletto Spy School, founded and brought to life by an enormously powerful woman entrepreneur, Alana Winter. The registration process alone was intriguing, I had to chose a special agent name and describe my real life as a cover identity. The day had three training elements, one more captivating than the other – always finishing with a reflection element in the group and transfer of fun and learning to real life. 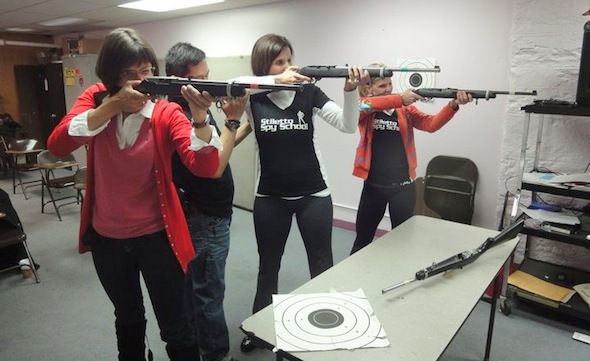 First, we learned how to handle a rifle and then how to shoot. I wasn’t doing that for the first time: As I grew up in Romania, we had in the 8th grade a training called something like “The Preparation of Youth for the Defense of the Republic”… that’s a long time ago. But I managed to hit almost only the bullseye! 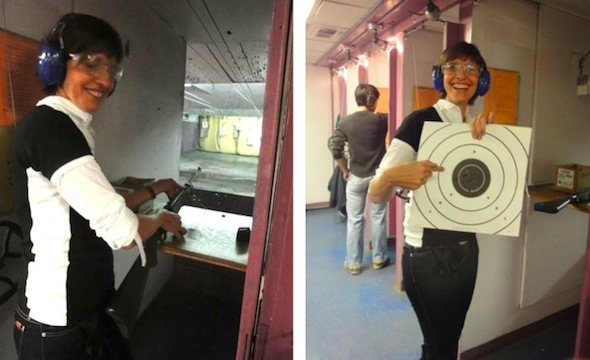 I had a lot of respect for being in a place with real weapons, but focusing on shooting on a target, really focusing and thinking of nothing else, gave me an extraordinary inner strength. Then, we had a guy called Val who trained us in combat and made us understand the neuralgic points of a human body. We’ve learned about the right breathing in a dangerous situation, and how to fall. I have a totally different relationship to hard wooden floors now – this wasn’t training on mats because you cannot order a mat when you’re just about to be attacked. The third part of our mission was about how to dance in a seducing way – a dancer and artist from the School of Burlesque did the training. A lot of girls’ talk, tips and tricks, but the most important was how to turn imperfection – or what we think is imperfect or even disastrous – into something lovable, attractive, fun. Just yesterday, a place called The Super Hero Supply Store gave me the playDUcative super WOW! What you first see is an incredibly well designed store, with basically gimmick themes articles, in our case everything about Super Heroes. The articles are something that people would buy in tons to give inspiring and extraordinary humorous presents to people who actually don’t need anything! 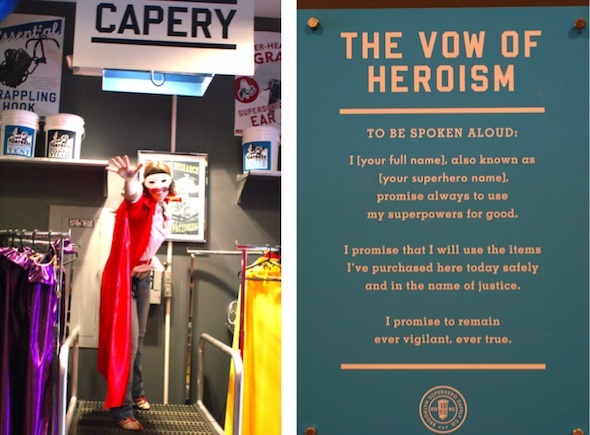 You can buy cans with superpowers, special equipment, you can experience a mind reader and a devillainizer, you can put a cape on and a mask, and when you buy something there you must take a vow that you will only use it for the good. If this does not put a huge grin on your face and absolutely warm you heart, you’re a “Spassbremse”, a kill-joy. Because of the awesome, playful, humorous ideas they never fail to find people who engage in this game, volunteer, donate money and time – also VIPs and well known stars. The power of repackaging not only stuff, but also the reality of life is great – a true superpower!